Electronic books should have replaced the printed books for years now, so we had been told. We are not there yet but some efforts are made such as with devices like Amazon’s Kindle or Sony’s reader. You can get (read: buy) most new books as an electronic version, the latest example is the new book from Dan Brown, already a best seller as an eBook but yet to be released on paper. There is still progress to be made for the eBooks to become more widespread. The prices should be more in sync with the advantages for the publishers. They don’t have the cost and delays of printing, they don’t have to distribute to book stores, etc.Â Still, prices when compared to the paper version, are almost the same. There are certainly many factors that are to be accounted for to make up these prices but it seems disproportionate and I am pretty sure the extra margins are not for the authors! 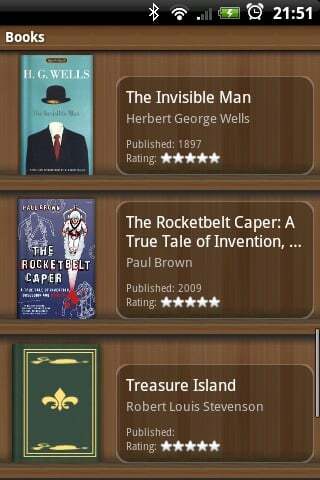 One of the great aspect about pocket devices like Android, is that they can be used as eBook readers and, with the right screen and software, it can be as good if not better than a Kindle. 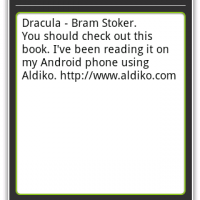 There are few ebooks readers for Android but I am going to talk about one in this review: Aldiko. Aldiko can help you do 3 things. 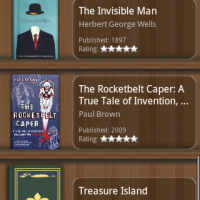 It will help you get eBooks (as .epub files), organise them and, obvioulsy, read them. There are 2 ways, the first one is to use many of the resources on the internet to buy or download EPUB. 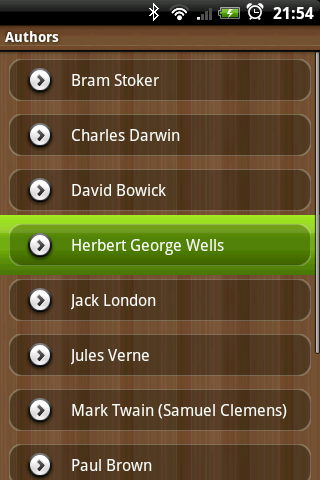 For example, there are the ones made available by Google Books or by the Project Gutenberg. You can also create your own .epub files for Aldiko from plenty of different sources such as Word doc, PDF, text files, HTML,… using tools like Stanza. Once you have your .epub files, you just need to copy them in a specific folder on your SDcard and import them in Aldiko so that they are visible in your library. The other method to get eBooks is directly from the app, it is linked to feedbooks (domain public books or self published authors) and also Smashwords (indie authors and publishers). For the latter, some of the books can be downloaded for free, others only the first few pages as a sample for you to decide if you want to buy them (from the web site, not the app). There are plenty of choices from these 2 sources in all genres and even in other languages than English (German, French and Spanish). For each book, before downloading, you will see the cover, a description and comments from other readers if there are any. All your downloads will be placed and organized on the SDcard. What makes a great app on any platform is the interface. 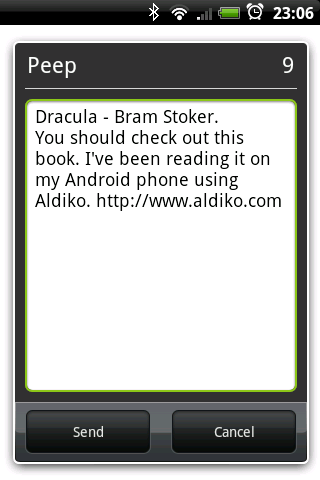 It has to be clear and intuitive and Aldiko developers have managed to do this. The main screen is divided in 3 parts. 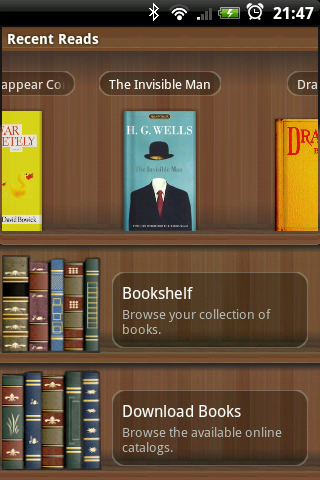 The top “shelf” will hold all the latest eBooks you’ve opened. The middle will let you access your entire library and the third will bring you to the download area for you to find new eBooks to read. 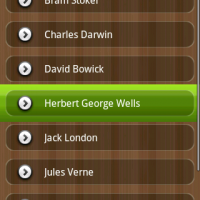 When reading, you should forget that you are holding an Android device and it should feel like having a paper book. 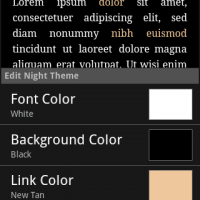 It is not exactly like that but very close, you don’t have to use cumbersome keys to turn pages, there are many ways to do it (all customizable in the settings) but my favorites are the taps: tap once on the bottom half to go forward one page, tap on bottom up to move backward one page. There are tons of options. 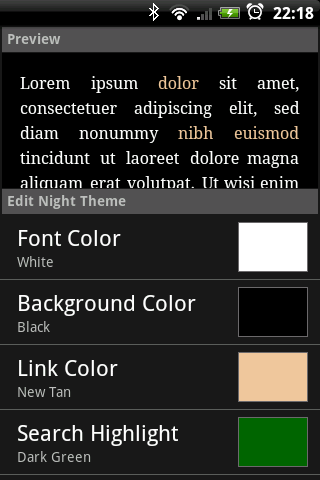 You can customize the colors used for the Day and Night themes, choose the fonts, change the layout settings, choose how to navigate and more. 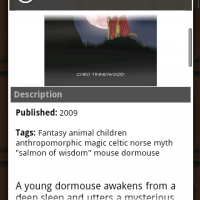 While reading you can access the table of content, your bookmarks and also search for words in the book. There is also an option called “Share” that will help you to share your reading list with friends via email, messages or twitter. Sometimes, especially with some authors from the last century, you could come across words that you don’t know, so you can start a Google or Wikipedia search directly from the app. On the negative side, only one format (epub) can be read. 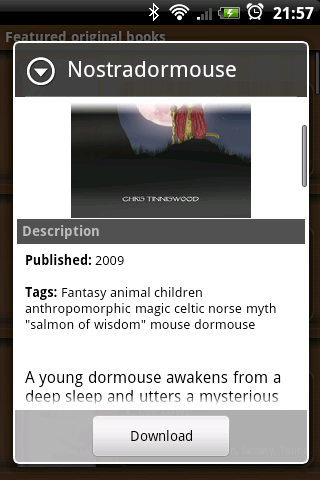 Furthermore, when you “close” a book in the app, it should automatically create a bookmark. As it is now, the book will re-open at the beginning of the chapter you were reading and you have to tap or slide to get to where you had stopped reading. That’s an extra step that could be avoided. Although there are few issues that could make the app the perfect eBooks reader, this is a really recommended “must have” app. 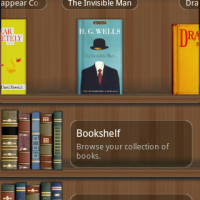 It will help you keep the good habit of reading books and, with its nice interface and features, it will make another great app to demonstrate the ability of the Android platform.